The German based P21S manufacturer is continuously seeking perfection with each one of their products and they succeeded with this fantastic wheel cleaner. Just spray your wheels down and rinse them clean with the P21S Wheel Cleaner. This unique wheel cleaner is pH balanced and gel based. This is contrary to most cleaners which use strong acids and are liquid based wheel cleaners. P21s Wheel Gel Cleaner is pH balanced and completely safe to use on any wheel with any kind of finish. There are no harsh corrosive agents in this cleaner that can possibly fade or tarnish the wheel. The gel formula helps clings to all vertical and horizontal surfaces that liquid based cleaners just run off of. The wheel gel then helps release road grime, brake dust and other contaminates that accumulate over time. Cleaning wheels has never been easier or more thorough. Get the safest and most effective wheel cleaner on the market with the P21S Wheel Gel Cleaner. The 1000ml and 5000ml bottles are considered a refill size by the manufacturer and it does not come with a trigger. The 500ml Kit comes with a trigger and a foam sponge to help you clean. 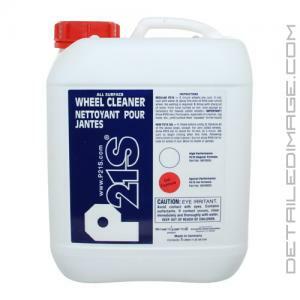 The P21S Gel Wheel Cleaner is a product I have used throughout my detailing career, both as an enthusiast and professional. It's hard to find a better alternative because this cleaner is both safe and effective, without the harsh smell of some other wheel cleaners. Rinse off P21S Gel using highest water pressure. Rinse very thoroughly, especially in crevices, lug holes etc., until surface feels "squeaky" to the touch. Product is not bad but not great. The brake dust on a Porsche is heavy. I have been looking for a product that would remove a large amount of the brake dust via an application and then "wash" off. A great deal of the brake dust remained on the wheels after letting sit from 5 minutes to 30 minutes. Based on my experience, for any wheel cleaner to work throughly, it requires manual brushing or wiping of some sort. P21 is no exception. But it does work well. When purchasing this product, just buy the lager bottle without spray nozzle. The spray nozzle that comes with this product is worthless, flimsy and leaky. I will waste a lot of the product. Just use your own spray bottle/nozzle. The only wheel cleaner I've used for 10 years. Why change when it is kind to the wheels, effective, I prefer the gel over the liquid as it can sit for a bit on all 4 before wiping off.